Are you a member of Goodreads.com? Have you ever posted a review for a book there? If so, you are invited to help me make this book visible among the sea of books! It’s even harder for a woman-in-charge workaholic during melt-down. 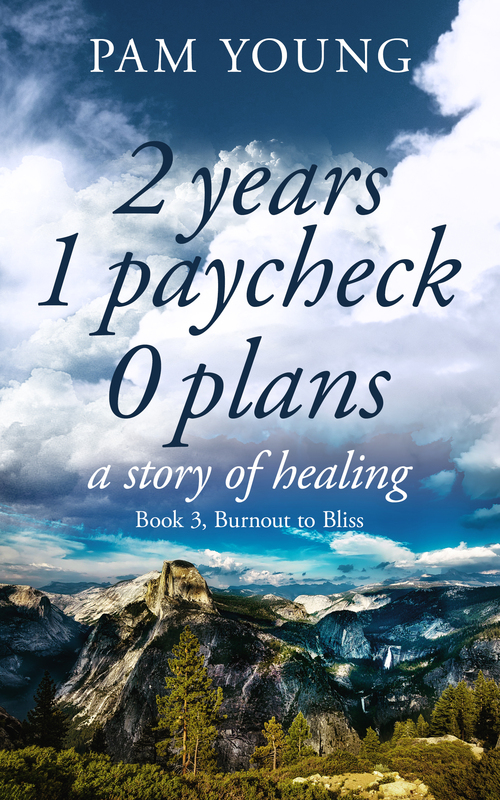 This is a tale of letting go and trusting that life is good and safe and that all needs will be met – for two years on 1 paycheck with 0 plans. In exchange for a free Advanced Readers Copy (PDF), you agree to write an honest review on your choice of Goodreads.com or Amazon.com (this choice involves a $.99 purchase). You have about 30 days to read and post. I will send you an email when it’s time to post your review and links for both Amazon and Goodreads. This offer expires February 21. Email me at pyheartworks@gmail,com with “I’m in!” on the subject line and I’ll mail you the PDF in exchange for your honest review (see The Deal above). This entry was posted in eBooks, Personal Journey, writing and tagged Burnout to Bliss series, healing journey, Indie author marketing, indie publishing, memoir, My Weird Indy Publishing Project, spiritual journey. Bookmark the permalink.